orkut, Google's social network, lets you keep track of the birthdays of your friends. There's a birthday reminders section that can be enabled in the settings and you can add a gadget to Google's personalized homepage. 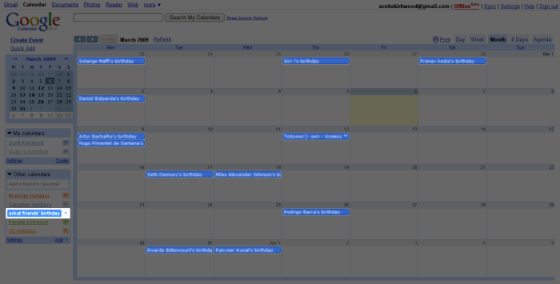 orkut's blog announced that there's another way to view the birthdays: in Google Calendar. "Now, in conjunction with Google Calendar, you can see all of your orkut friend's birthdays for the whole year. If you've already used Google Calendar before, you will shortly see a link (right below the "upcoming birthdays" section) where you can add your orkut friends' birthdays to your Google calendar." If you don't see the promotional link, use this URL to subscribe to the calendar. Google uses a special kind of calendar that requires authentication and doesn't support notifications. That means you won't be able to receive email or SMS notifications that remind you of the birthdays. FWIW, I do this on Facebook by using the fbCal (http://www.fbcal.com or http://apps.facebook.com/fbcalendar) Facebook application to generate an ICS file that I then import as an external calendar using Google Calendar. You just add your friend's birthdays onto Google calendar as-is and set to yearly recurrence. I don't use orkut and really don't plan to. What I want is for Google contacts to have fields for birthdays and be able to import them into my google calendar. I also want fields for anniversaries and webpages. Can you take the birthday info from contacts and have it show up in the calendar? I wrote a post which talks about pulling birthdays from social networks, google contacts, google profile, putting this data into Google Calendar and also to mobile phones.